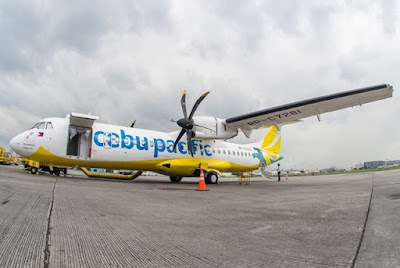 Aviation Updates Philippines - The Philippines' leading airline, Cebu Pacific (PSE: CEB), further expands its network to two of the fast-rising areas in Luzon as it sets off the maiden flights for two of its new routes on February 15, 2017. FLYING DIRECT TO TABLAS AND MASBATE. Cebu Pacific Air's subsidiary Cebgo has launched flights to Masbate and Tablas from Manila on February 15, 2016. Flights are operated by Cebgo's new ATR 72-600 aircraft which can seat up to 78 passengers. Photo by Cebu Pacific Air. Aside from Manila, CEB also operates flights out of five other strategically placed hubs in the Philippines: Cebu, Davao, Clark, Kalibo, and Iloilo. The airline's extensive network covers over 100 routes and 66 destinations, spanning Asia, Australia, the Middle East, and USA.